• Besides maintenance, DroneMapper will strive to improve the functionality of the applications through time at no cost to you. When significant improvements or functionality have been incorporated, new versions of the applications may be released. You can choose whether these will be beneficial to your needs and pay any additional fees associated for that update/upgrade version. • If you have specialized needs that are not supported, we are interested in hearing from you and please feel free to contact us to discuss. This End-User License Agreement (EULA) is a legal agreement between you (either an individual or a single entity) and the mentioned author (DroneMapper.com) of this Software for the software product identified above, which includes computer software and may include associated media, printed materials, and “online” or electronic documentation (“SOFTWARE PRODUCT”). a) DroneMapper RAPID (Free Version) is being distributed as Freeware for personal, commercial use, non-profit organizational and educational purposes. It may be included with CD-ROM/DVD-ROM distributions. You are NOT allowed to make a charge for distributing this Software (either for profit or merely to recover your media and distribution costs) whether as a stand-alone product, or as part of a compilation or anthology. 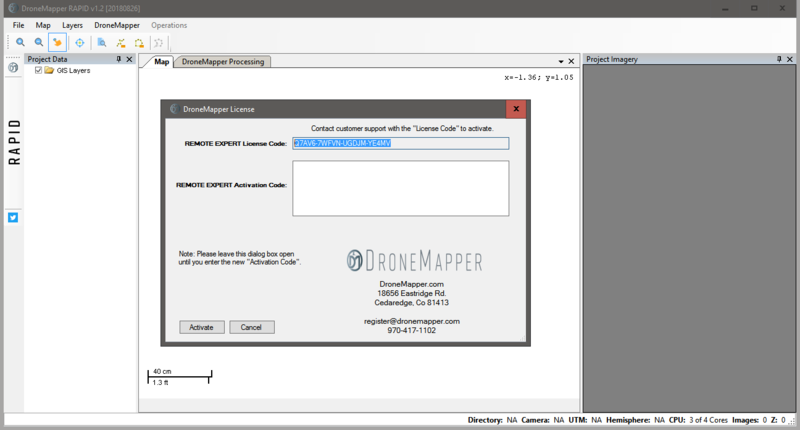 b) DroneMapper REMOTE and REMOTE EXPERT (Licensed Versions), are being distributed as licensed SOFTWARE PRODUCT for personal, commercial use, non-profit organizational and educational purposes. It may be included with CD-ROM/DVD-ROM distributions. You are NOT allowed to make a charge for distributing this Software (either for profit or merely to recover your media and distribution costs) whether as a stand-alone product, or as part of a compilation or anthology. 1. GRANT OF LICENSE. This EULA grants you the following rights: You may install and use an unlimited number of copies of the RAPID SOFTWARE PRODUCT. You may install and use one REMOTE and REMOTE EXPERT SOFTWARE PRODUCT per license granted. Limitations on Reverse Engineering and Decompilation: Disassembly and change (addition, deletion or modification) of the resources in the compiled SOFTWARE PRODUCTS is not allowed. You may not reverse engineer, decompile, or disassemble the SOFTWARE PRODUCT, except and only to the extent that such activity is expressly permitted by applicable law notwithstanding this limitation. All SOFTWARE PRODUCTS may be updated in the future to correct operational issues and/or provide enhanced features or functionality. DroneMapper will advise license grantees the nature of the update and any associated terms for the revision.